Cross'N My Stitches: Happy New Year! Out with the old and in with the new so the saying goes. In a stitcher's case though, a lot of the old just may be some WIP's that need attention for a few more days,,,,,,or weeks even! Here is one WIP below. I have 20 hours into it thus far and I'm really enjoying it. Doesn't need to be ready with frame and all until May. A day that this family is so excited about and looking forward to. I did knit up another scarf, and this one is all for me this time! I have made several over this past year and they were all gifts. So I'm excited that I have one now and yarn to make five more in different colors. They do make up quickly and I find the only thing that I don't like is the fact that the needle falls out of the few stitches very easily! I love the colors in this one and it will go with some of my sweaters. Over the Christmas holiday events, I kitted up three more pieces that I want to do this coming year. Oh yes! I do have many more kitted up, but they all excite me. After not having anything at all to stitch a couple of years back after finishing a piece, I decided that, that wouldn't ever happen again. It was every bit as bad as taking my coffee away in the morning! So, the three new charts all ready to go with threads and fabric are, "Mares Eat Oats". Last but not least. 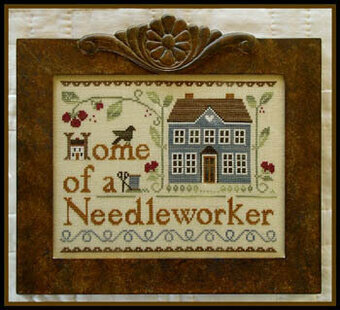 "Home of a Needleworker Too"
I do want to welcome my newest follower. Monika from http://mon-peci.blogspot.co.at/ Monika does all kinds of interesting things and beautiful work. Stop on over and see her at her blog. So glad you decided to join in here Monika. Matthew has been home for the last few days and is due back today. "Home" is just a little over a mile away, so not too far at all for us to run over there or for Mom and/or Dad to stop in here with anything needed. Though we pray each and every morning and night that Matthew will be able to return home one day, we sure do miss him when he isn't here. He's Grampa's buddy and Nana's love. I noticed that the poke weed has multiplied over this last year. Found the one and only plant last spring and now I see that there are five or six new ones. No! We have never eaten any, but to be honest, I loved the new flowers and brightly colored stem ends and berries that I discovered and am thinking about leaving the plants alone. Will decide one way or the other when gardening weather is here once again. Need to let you my dear followers and friends go for today. Happy New Year once again to each of you. May your year be filled with "beautifuls" and good health. Love each and every one of you. Until next time, stay well and warm and remember to "feel the colors". I love your scarf and WIP; they are both so pretty. I like kitting up multiple projects too. Those projects look really fun. Thank you so much Mary. 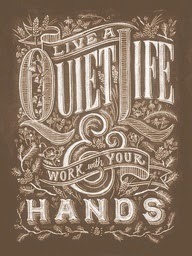 It really is nice to have projects ready to go and I agree. The ones I have kittled up look like fun. Thank you so much for stopping in. 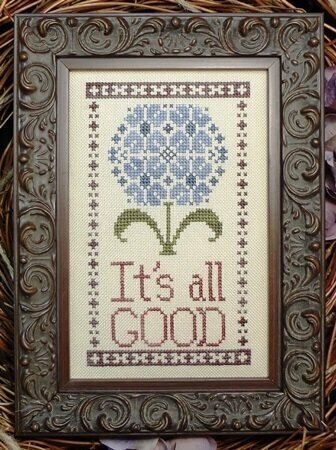 Love your three new charts- i stitched the needleworker chart before- i think you will enjoy it! I think I will enjoy it too Patty. I love having everything ready to go. Look at those beautiful pieces. You just keep making the nicest needlework. Thank you so much for your lovely comment. A wonderful blessed year ahead for you as well with lots of beautiful flowers. Hi Bonnie~ The yarn I use is Starbella. Michaels usually has the yarn. We don't have a Hobby Lobby in this area or a JoAnn's but they may carry it as well. I start by putting on eight of the loops from the yarn. After I have stretched the yarn open of course, and I just keep knitting the eight stitches until nearly all the yarn is used. They make up real fast Bonnie. You can go here for a video as well. great update! You have some great projects in the works!!!! Love the scarf. A friend told me about them & I bought yarn for 2 but haven't gotten the hang of it yet. Maybe I need to try again!!! Hi Shari~Please do give the scarves another try. They work up so quickly. I've been knitting mine and find the only bad this about that is the fact that the stitches are so loose that the needle tends to fall out. I just make sure to be careful now when I set the work down. Thank you so much for stopping in.